Qu'est ce que l'institution "Cranial Academy", Français et espagnol auront la réponse çi-aprés! The Osteopathic Cranial Academy is an international membership organization based in the United States. Training in the cranial concept is available to all qualified health care practitioners. Each may apply the cranial concept within the accepted standards of their individual professions. In the United States, Doctors of Osteopathic Medicine (DOs) are fully trained physicians, licensed to practice the entire range and scope of medicine and surgery. US trained DOs attend their own medical schools, receive the same post-graduate training as their MD colleagues, and receive additional education in the principles of osteopathy, applied in practice as osteopathic manipulative treatment. Osteopathy is a system of medicine that recognizes the dynamic relationship of structure and function in health and disease. Only US trained DO’s can be licensed to practice osteopathic medicine in the USA. Outside the United States, each country administers educational and licensing standards specific to that domain. Some countries may have non-medical osteopathic colleges whose graduates receive a “Diplomate of Osteopathy,” (also titiled “DO”). These non-US osteopaths can not perform medical diagnosis, prescribe medications, or perform surgery. Some countries may have a post-graduate certificate program in osteopathy for medical doctors. All US trained DOs, non-US Diplomates of Osteopathy, and international physicians with post-graduate training in osteopathy subscribe to osteopathic principles and philosophy. Non-US DOs and international physicians with post-graduate training in osteopathy must meet the standard set by the official Registry of their respective country in order to be granted membership in The Osteopathic Cranial Academy as Affiliate Members. Osteopathic Principles focus on the natural motion within the body's structure and its relationship to function. The DO learns how to restore health by applying osteopathic principles in the practice of hands-on treatment. Osteopathic knowledge and treatment considers the musculoskeletal system to be an extremely important but often neglected aspect of total health. It must also be emphasized that osteopathy considers the inter-relationships of all physiologic systems (e.g., neurological, respiratory, digestive, etc.). Cranial Osteopathy is an expansion of the general principles of osteopathy which includes a special understanding of the central nervous system and a mechanism called primary respiration. 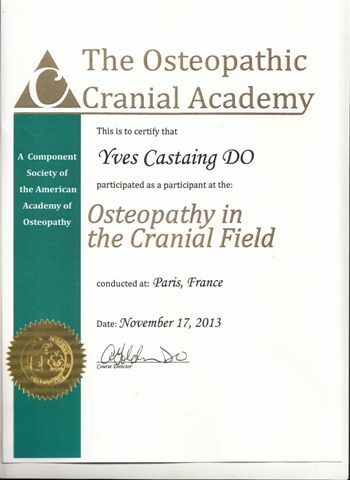 Those who wish to practice Cranial Osteopathy train intensively through post-graduate studies. Recongition of Proficiency may be earned by members of The Osteopathic Cranial Academy who demonstrate clinical ability in Osteopathy in the Cranial Field.